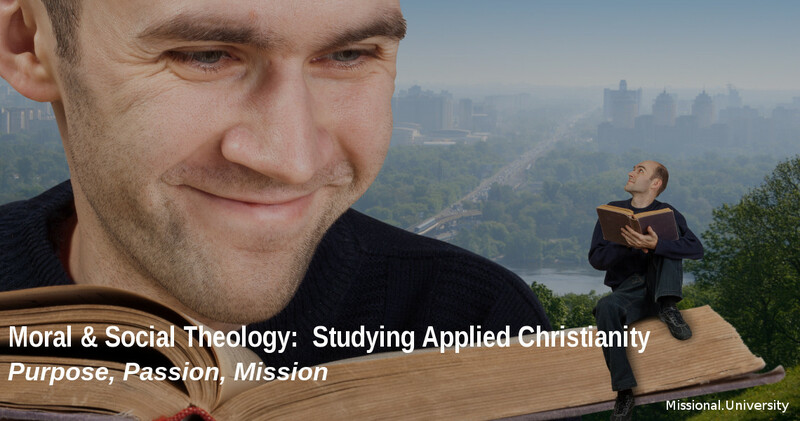 The Department of Moral & Social Theology builds on the foundation of biblical studies so that the fulfillment of the missio dei is always consciously tied to the practice of a biblically grounded personal and social ethic. The current global situation demands that every missional graduate be fully aware of relativistic and pluralistic worldviews and of issues of personal and social injustice, and be equipped to engage those confident of both ethical ends and means. Our world is ruled by relativism, pluralism, and pragmatism. It manifests selfishness, oppression, and injustice. Those seeking to live missionally must be confident they are standing and operating on a solid biblical and theological foundation for both ethical and just means and ends. The missional student must know two things: One, that there is a Biblical basis for a cross-cultural and cross-generational moral and social theology. Two, the student should also know that the character and integrity of the messenger and the grace, compassion, and justice of the method can and will enhance or block the communication of the gospel message or the implementation of gospel justice. The Department of Moral & Social Theology will challenge students to explore, analyze, and evaluate their personal, cultural, familial, and assumed moral and social ethic, always driving them back to biblical and theological foundations. Graduates will then head into missional lives and ministries confident that their lives, decisions, relations, and methods are grounded in a biblical theology. The Department assumes and builds on faithful research of the biblical text, which is the starting point and motivating factor for developing a missional theology. Our concern is that moral and social theology move us from the classroom to the boardroom, the business center, the academic setting, the halls of government, and beyond. Therefore, theological reflection is driven by the redemptive mission of God as expressed in texts such as Gen. 12:1-3, Ps. 96:1-3, Isa.12:4-5, Matt. 28:28-30, Lk. 2:30-32, and Rom. 8:18-25. God’s mission, and the one his people are called to, is that all nations (peoples) may know him and that someday those from “every tribe and language and people and nation” may give him praise. Therefore, the Department of Moral & Social Theology believes the building of practical missional theology requires intercultural input with an intercultural goal. The Department knows that culture matters, and that biblical moral and social theology applies to and transcends all contexts. It is also an integral part of the development of moral and social theology because our assumption is the full authority and ability of the bible to transform every culture and context. The goal of the Department of Moral & Social Theology is transformation and fruitfulness in students’ lives. Students will be challenged and taught to take what they have learned and apply it in personal ministries, in restorative ministries, and in social action. The study of moral and social theology from a missional perspective will not be a mere intellectual or academic exercise. These will, rather, thoroughly engage the student for both personal transformation and ministry effectiveness through opportunities for reflection and the theological analysis and evaluation of ministries.